Hello! Ready to sew? 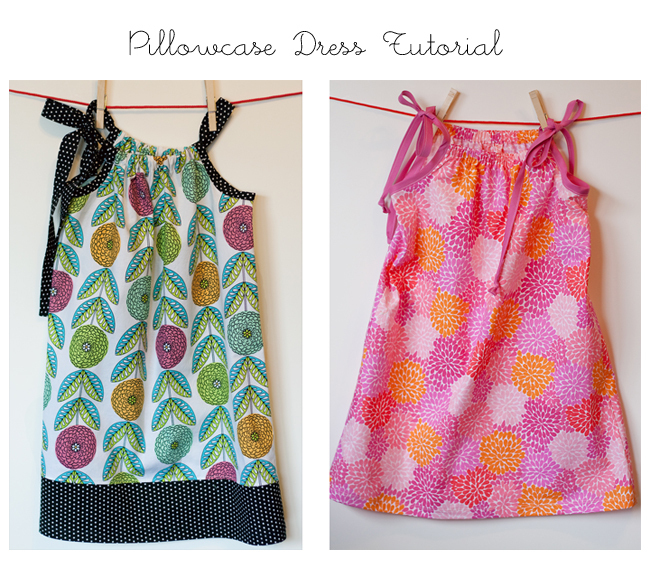 I've come up with a tutorial and pattern for my favorite version of the super easy and very popular pillowcase dress for the Dress A Girl Around the World Sew-A-Long. I threw in a few variations for good measure. You can find the printable pattern here or here. 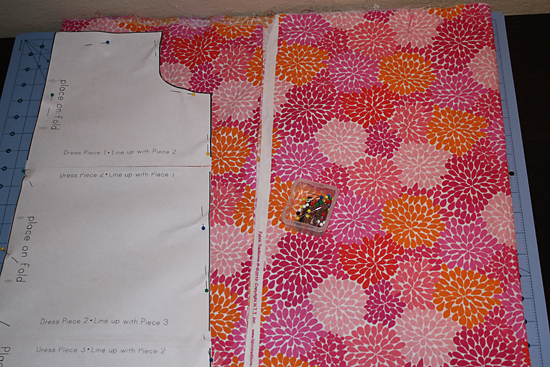 The pattern and instructions will produce a dress that will fit girls of varying sizes and ages. It is approximately 22 inches long (from neck casing to hem) and can easily be lengthened or shortened. when you've printed the pattern, check that the square box measures and inch. if so, you are in business. line the printed pages up edge to edge and tape. do not overlap pages. Print pattern here or here. *make sure to use lightweight (but not sheer) fabrics. You'll also want to pre-wash your fabric and press before getting started. 1. Take your fabric, fold in the sides (selvage to selvage) to meet in the middle. 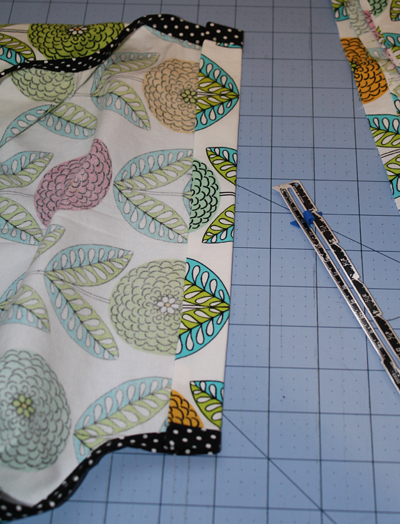 Place pattern on one side, with the straight edge of your pattern piece aligned with the fold. Pin in place and cut. 2. Take your pattern, flip it over, and place it on the opposite side, straight edge aligned with the fold. Pin in place and cut. 3. Take your dress pieces and place them right side down. Fold the fabric ¼” along the hem line and press. Fold up ¾” and press. Once you have your hem creases, unfold. 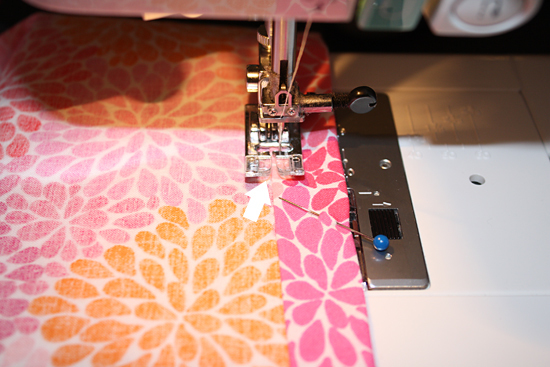 This will make it much easier to hem your dress later! 4. Next, we'll create the casing for the elastic. *If making a dress with a fabric tie casing (one long fabric tie that ties in a bow on one shoulder), skip down to step 5. Fold the fabric down ¼” at the top of the dress and press. Fold down ¾ of an inch and press. Stitch about 1/8thinch from the bottom and top edges of the casing you created. Press casing. Do this for both the front and back of the dress. *tip for beginner's: I like to line up an edge (inner or outer depending on what I'm sewing) of my presser foot with the edge of the casing/hem. 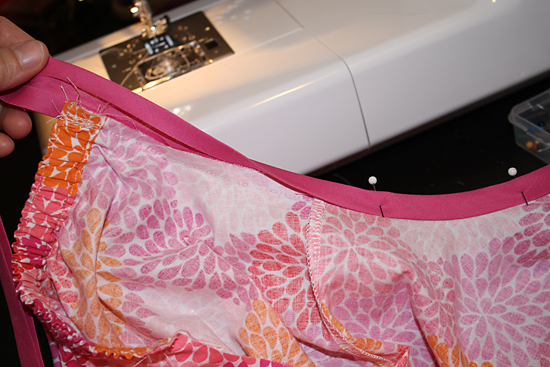 Then, I move the needle position close to the edge of the casing/hem. This helps to give you a nice, straight line of stitching. In the photo, I lined up the left inner edge of my presser foot against the folded edge of my casing. I moved my needle towards the right. 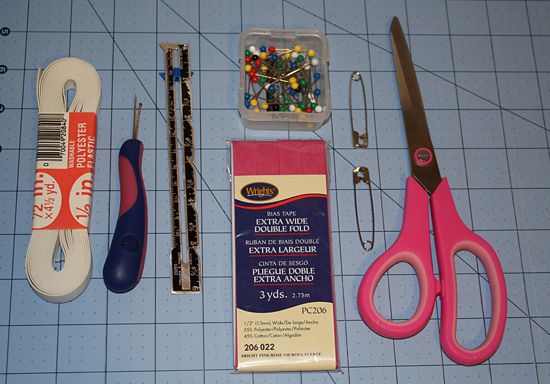 Next, cut 2 pieces of 6.5” of ½” elastic and attach safety pins to both ends. Feed the elastic through the casing and pin. Remove safety pins and sew the elastic in place at both ends of the casing. Repeat for other side of dress. 5. 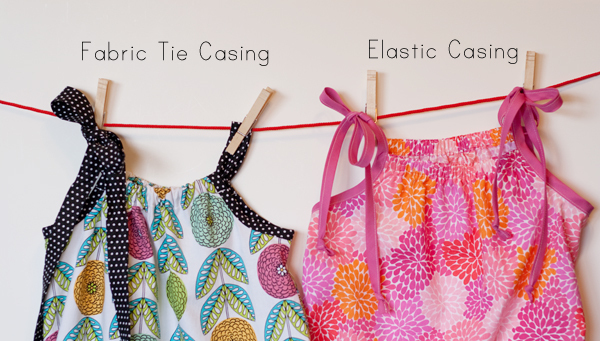 Now you’ll sew the side seams of your dress. Place one dress piece on top of the other, right sides facing, and pin together along the side seams, starting at the bottom of the arm hole and ending at the bottom of the dress. Use a ¼” seam allowance. 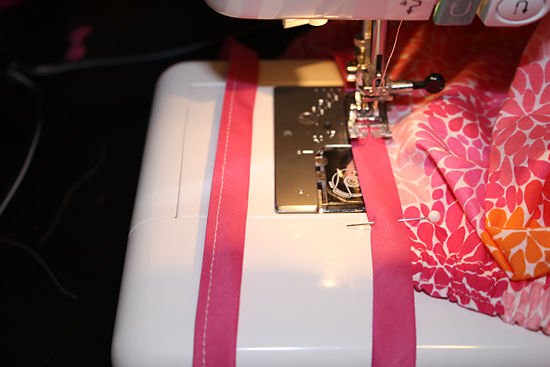 Make sure to backstitch at the beginning and end of your seam.You'll need to finish your seams by serging, pinking, or zig zag stitching. Press the seams when finished. 6. Next, grab your package of bias tape and cut two pieces about 46-48 inches long. Take one piece, unfold it, find the mid point and mark it. 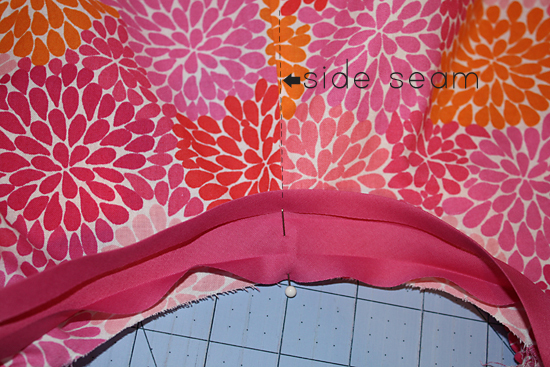 Match the mid point of the bias tape (right sides touching) to the seam of one of the arm holes. Finish pinning the bias tape to the entire arm hole. Sew just inside the crease of the bias tape, from one end of the arm hole to the other. Do the same for the other arm hole. 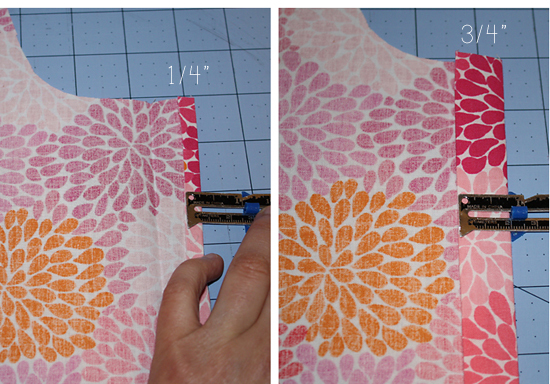 Now, fold the bias tape over to the inside of the arm hole and press. 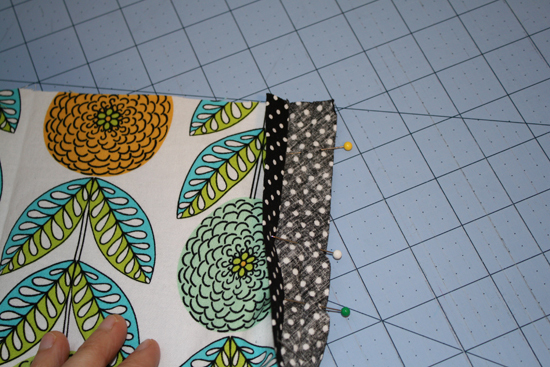 Place a few pins along the entire length of the bias tape, especially along the arm hole. Place one end of the bias tape under your presser foot and sew close to the open edge for the entire length of it, from one end to the other, making sure to catch the back of the tape along the arm hole. Cut 2 strips of bias tape 2" wide and 13" long. 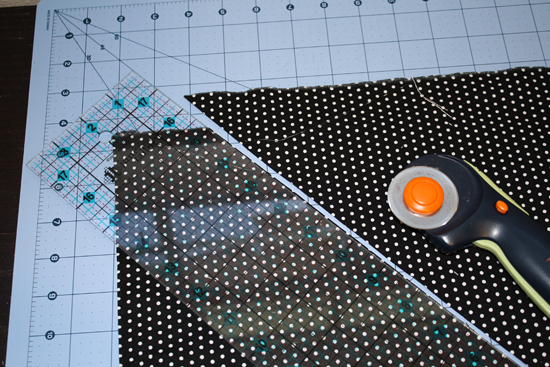 To make your own bias tape , use the 45 degree marking on your cutting mat as a guide. 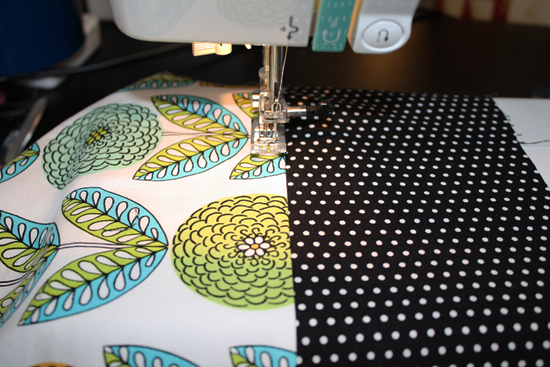 Line the left edge of your fabric piece with a vertical line on your mat. Place your ruler along the 45 degree line and cut. Once you've made a cut on the bias, turn the fabric so the cut edge of your fabric is parallel to the vertical lines on your cutting mat. Cut (2) 2" strips. Fold the strips in half lengthwise and press. Open back up and fold both sides in towards the middle, then fold in half. Press with iron. Let's attach the bias tape to the arm holes. Take one piece, unfold it, find the mid point and mark it. Match the mid point of the bias tape (right sides touching) to the seam of one of the arm holes. Finish pinning the bias tape to the entire arm hole. Sew just inside the crease of the bias tape, from one end of the arm hole to the other. Do the same for the other arm hole. 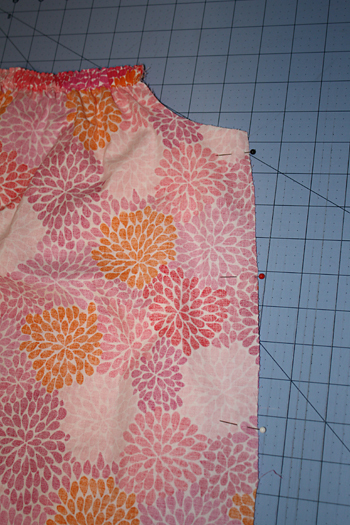 Now, fold the bias tape over to the inside of the arm hole and press. 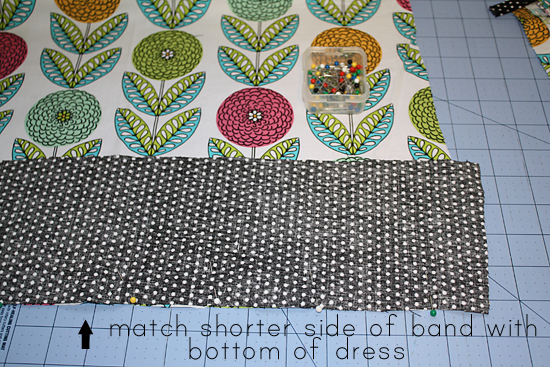 Place a few pins along the entire length of the bias tape. Place one end of the bias tape under your presser foot and sew close to the open edge for the entire length of it, from one end to the other, making sure to catch the back of the tape along the arm hole. Now, fold the fabric down ¼” at the top of the dress and press. Fold down 1” and press. Sew a long the bottom edge of the casing only. Basically, it's the same as the elastic casing but wider! See photos in step 4a you need to. Do this for both the front and back of the dress. Almost finished! You'll need to make a fabric tie to feed through the casing. I don't have photos of this step but it's really simple! 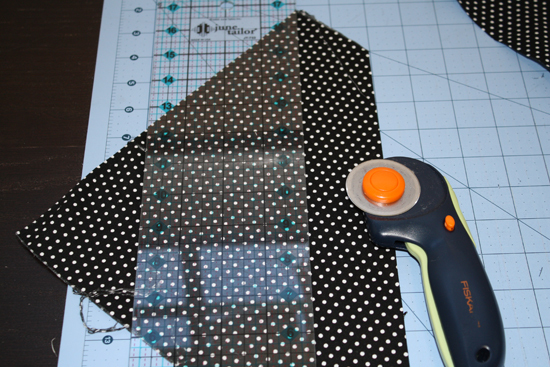 Cut a strip of fabric about 64" long and 2.5" wide. 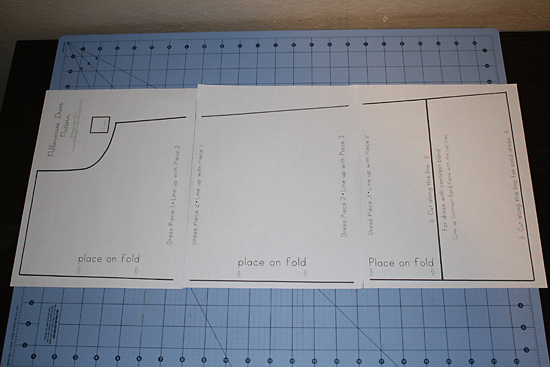 Fold in 1/4" along all four edges of the strip and press. Fold the fabric in half, wrong sides touching, and press. Sew along all 4 edges of the tie. Now, attach a safety pin to one end of the tie and pull through the front casing and then the back. Even up the ties and then tie a nice bow on one side. 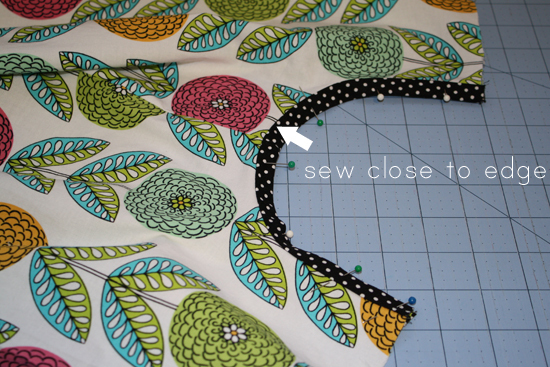 Go back up to step 7 (hemming) and finish up your dress! !